AMD has today announced the introduction of three new Radeon HD 3000-series graphics products that will replace the relatively lacklustre Radeon HD 2600 and Radeon HD 2400 series graphics cards. Two of the new cards make up the Radeon HD 3400-series, the HD 3450 and HD 3470, while the remaining card is called the Radeon HD 3650. The basic premise of these cards is not to massively improve the performance, but to improve the feature set quite significantly. 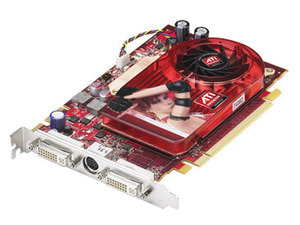 As such, the new cards have inherited all of the features from the Radeon HD 3800-series, which means they’re manufactured on one of TSMC’s 55nm processes, and feature DirectX 10.1 support, ATI PowerPlay technology, PCI-Express 2.0 and improved CrossFire support... but that’s not all – there’s more too. Over the course of this article, we’re going to outline what’s new in these new cards. Sadly though, we don’t have any hardware at the moment, which means that we’re unable to compare their performance to what is already on the market. 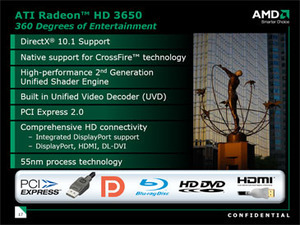 Hopefully, we’ll at least get to have a closer look at a Radeon HD 3650 soon, though. During our extensive coverage of RV670—the GPU powering the Radeon HD 3870 and Radeon HD 3850 cards—we outlined the fact that, for the most part, the underlying architecture in the Radeon HD 3000-series is essentially the same as was used in the Radeon HD 2000-series, but it incrementally improved on a number of the shortcomings. As with the RV670-based products, the RV635 and RV620-based cards don’t use the traditional Pro, XT and XTX suffixes – instead the company differentiates the products in their actual product number. The ‘50’ is the equivalent to an old ‘Pro’ card, while the ‘70’ is basically defining the card as the ‘XT’ of old. 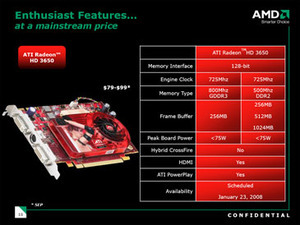 Despite only offering one model name, there are still two products that fit under this name – both share the same engine clock, which is set at 725MHz (slower than the Radeon HD 2600 XT’s engine clock), and the same number of stream processors as the Radeon HD 2600 series cards (120 stream processors or 24 five-way superscalar shader units) – both also feature a 128-bit memory interface. The number of texture units and raster operators hasn’t changed either, meaning there are still just eight texture units and four raster operators (or ROPs). 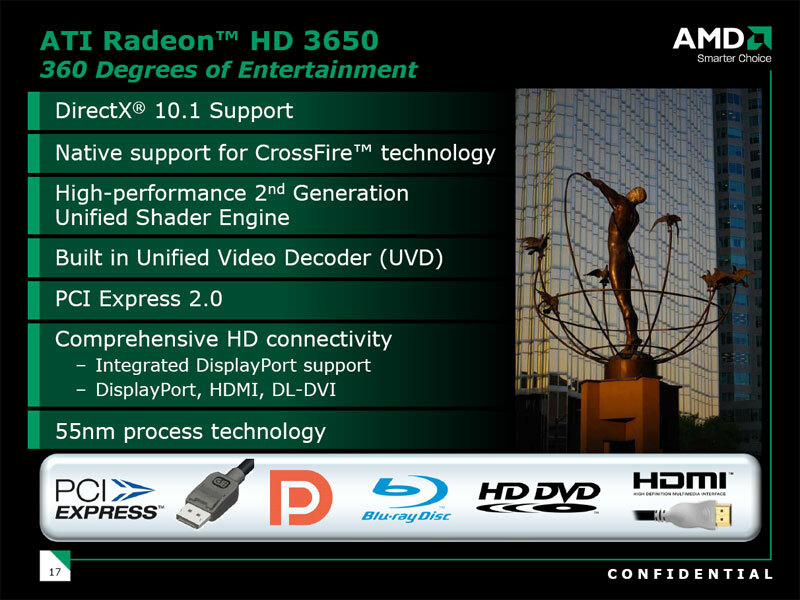 What has changed architecturally now though is that there is support for DirectX 10.1, PCI-Express 2.0 and ATI PowerPlay at a high level... at a much lower level, I've heard (but still waiting for confirmation) that AMD has added double precision support at one quarter speed, but it’s not exposed in current 3D graphics APIs. 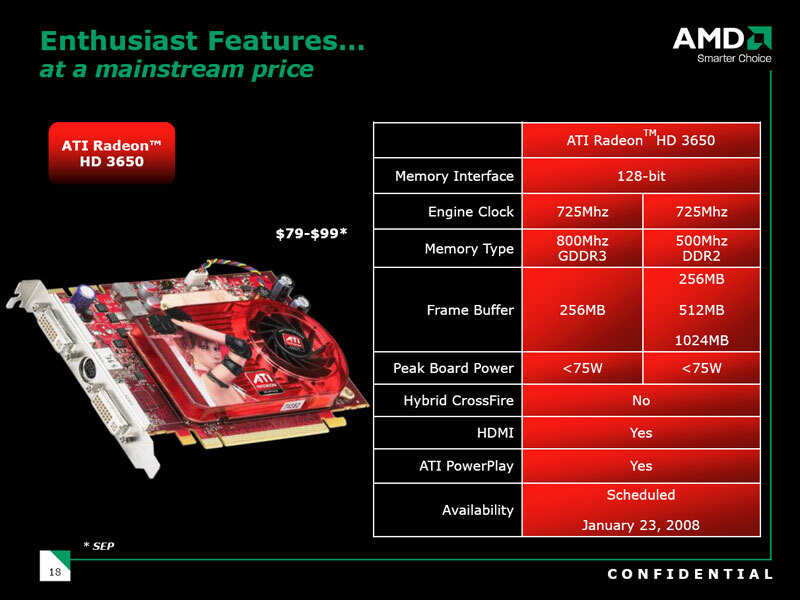 Update: AMD has confirmed that the shader units are exactly the same as those in the RV670, which means there is double precision support, However, AMD is choosing not to market this because its use is limited to GPGPU and these cards aren't going to be brutes in those kind of workloads. RV635 also uses fewer transistors—a total of 378 million—than the RV630 chip, which itself featured a pretty massive 390 million of the little blighters. AMD says that it has made some optimisations during the die shrink, which should help to improve performance per clock and efficiency a little bit when it’s compared to the ASIC it’s replacing at the same clock speed. What separates the two models from one another is the memory clock speed and frame buffer size. Iain explained that the core clock speed isn’t everything on the Radeon HD 3650 – memory speed can change performance too. The top Radeon HD 3650, which will probably sit at around £60 (inc. VAT) comes with 256MB of GDDR3 memory clocked at 1,600MHz (effective). The second, albeit slower Radeon HD 3650 will come with either 256MB, 512MB or 1024MB of DDR2 memory clocked at around 500MHz and that’s expected to be priced anywhere from £45 to £60 (inc. VAT), depending on the amount of memory on the card. Now, I’m not quite sure why AMD is going down this route, because it said that partners will also overclock the cards – the result could quite easily be a rather confusing situation for consumers. I’ve already been pretty vocal about massive(ly useless) memory sizes on mainstream cards in the past because it’s frankly not needed at all – it plays on the ‘you can never have enough RAM’ consensus that is very true with system memory, but not so true with graphics card memory. There’s no point in lots of graphics memory if it’s not got a fast enough connection to the GPU, or the GPU itself isn’t powerful enough to really benefit from more memory. AMD says that the Radeon HD 3650 uses less than 75W of power at peak and supports everything you’d expect a Radeon HD 3000 series product to support – we’ll come back to those later though, as they’re common for the Radeon HD 3400 series as well. Last week, I spent some time with AMD in Warsaw, Poland with the intention of finding out what's going on inside the newly-crowned platform company. The three elements that make up the Spider's web were the talk of the town, but I left somewhat disappointed.